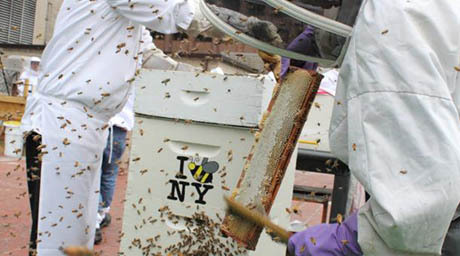 IMAGE: Bees on the roof of the Waldorf Astoria in New York. Photo courtesy the Waldorf Astoria, via American Public Media’s Marketplace. A beehive is the urban roof accessory du jour, even more popular than its eco-friendly cousins, solar panels or greenery. New York City’s Waldorf Astoria hotel is only the most recent to join a trend that includes roofs from the Paris Opéra to Chicago’s City Hall, as high-end chefs, locavores, and urban homesteaders alike enjoy the taste of honey made from trees and flowers in their own neighbourhood. One church was reportedly hit 14 times in 2011 alone as thieves returned again and again to take the new lead each time it was replaced. 2010 was the third worst year on record for the theft of metal from churches, with 1,484 claims costing the insurer more than £3 million. 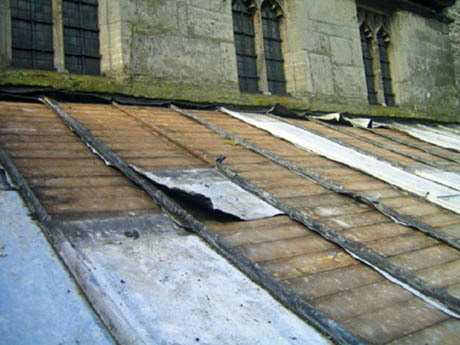 IMAGE: A partially stripped British church roof. Photo courtesy Ecclesiastical Insurance, via English Heritage. Curiously, you can unite these two trends with fantastic results. In what seems to be an extremely clever solution, would-be thieves are effectively dissuaded without the intrusion and expense of alarms and security guards. Meanwhile, the congregation can be kept sweet and/or future repairs subsidised through the gift or sale of holy honey. IMAGE: The Rosslyn Chapel hives. Photo courtesy The Times, via BLDGBLOG. Of course, it’s possible that the canny folk of York were not the first to come up with this idea. Certainly, while reading the letter, I was reminded of the 2010 discovery of two stone beehives carved into a pinnacle on the roof of Scotland’s fifteenth-century Rosslyn Chapel. 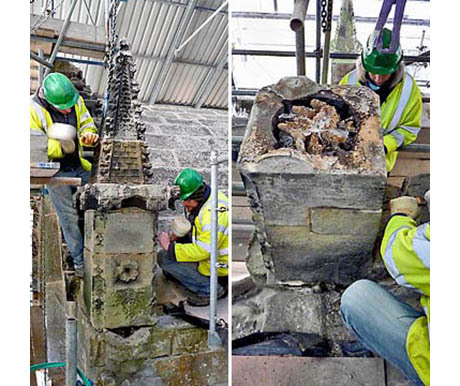 The BBC reported that the manmade hives, which the bees could enter through a hole in a carved stone flower, had been inhabited until “a canopy was put over the chapel during renovation works,” and that the bees would likely return when the repairs were finished. Scotland does indeed enjoy a climate that is frequently both wet and cold, and perhaps metal theft was not quite as pressing a concern in the middle ages. Nonetheless, with burglary deterrence to add to their gifts of honey and pollination services, sharing our roofs, religious or otherwise, with bees seems like a pretty sweet idea. NOTE: Thanks for passing along the letter, Dad! I’m proud to say that I recognize my father’s purple gloves in the foreground of the picture from the Waldorf=Astoria rooftop. I love you Norm! I have no idea, sorry — the letter is not specific.